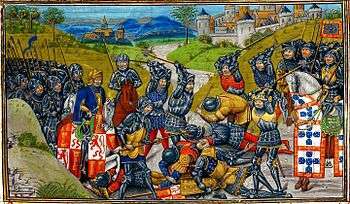 The Battle of Aljubarrota (Portuguese pronunciation: [aɫʒuβɐˈʁotɐ]) was a battle fought between the Kingdom of Portugal and the Crown of Castile on 14 August 1385. Forces commanded by King John I of Portugal and his general Nuno Álvares Pereira, with the support of English allies, opposed the army of King John I of Castile with its Aragonese, Italian and French allies at São Jorge, between the towns of Leiria and Alcobaça, in central Portugal. The result was a decisive victory for the Portuguese, ruling out Castilian ambitions to the Portuguese throne, ending the 1383–85 Crisis and assuring John as King of Portugal. Portuguese independence was confirmed and a new dynasty, the House of Aviz, was established. Scattered border confrontations with Castilian troops would persist until the death of John I of Castile in 1390, but these posed no real threat to the new dynasty. To celebrate his victory and acknowledge divine help, John I of Portugal ordered the construction of the monastery of Santa Maria da Vitória na Batalha and the founding of the town of Batalha (Portuguese for "battle", Portuguese pronunciation: [bɐˈtaʎɐ]). The king, his wife Philippa of Lancaster, and several of his sons are buried in this monastery, which is now a UNESCO World Heritage Site. The end of the 14th century in Europe was a time of revolution and crisis, with the Hundred Years' War between the English and the French for Western France, the Black Death devastating the continent, and famine afflicting the poor. Portugal was no exception. In October 1383, King Ferdinand I of Portugal died with no son to inherit the crown. The only child of his marriage with Leonor Telles de Meneses was a girl, Princess Beatrice of Portugal. In April of that same year the King had signed the Treaty of Salvaterra de Magos with King Juan I of Castile. The treaty determined that Princess Beatrice was to marry Juan I, king of Castile, and the Crown of Portugal would belong to the descendants of this union. This situation left the majority of the Portuguese discontent, and the Portuguese nobility was unwilling to support the claim of the princess because that could mean the incorporation of Portugal into Castile[a]. Also, the powerful merchants of the capital, Lisbon, were enraged at being excluded from the negotiations. Without an undisputed option, Portugal remained without a king from 1383–85, in an interregnum known as the 1383–85 Crisis. The first clear act of hostility was carried out in December 1383 by the faction of John (João), the Grand Master of the Aviz Order (and a natural son of Peter I of Portugal), with the murder of Count Andeiro. This prompted the Lisbon merchants to name him "rector and defender of the realm". However, the Castilian king would not relinquish his and his wife's claims to the throne. In an effort to normalize the situation and secure the crown for himself or Beatrice, he forced Leonor to abdicate from the regency. In April 1384, in Alentejo, a punitive expedition was promptly defeated by Nuno Álvares Pereira, leading a much smaller Portuguese army at the Battle of Atoleiros. This marked the first use in the Iberian peninsula of the English defensive tactic of forming an infantry square to repel cavalry, reportedly without any casualties to the Portuguese. A larger second expedition led by the Castilian king himself reached and besieged Lisbon for four months in the summer of 1384, before being forced to retreat by a shortage of food supplies due to harassment from Nuno Álvares Pereira, and the bubonic plague. In order to secure his claim, John of Aviz engaged in politics and intense diplomatic negotiations with both the Holy See and England. In October 1384, Richard II wrote to John (later King John I), regent of Portugal, reporting on negotiations, conducted in England, with John’s envoys - Dom Fernando, master of the order of Santiago, and Laurence Fogaça, chancellor of Portugal saying that an agreement had been reached under which an English force was to be sent to Portugal, to help defend the kingdom against its Castilian neighbor. On 6 April 1385, (the anniversary of the "miraculous" battle of Atoleiros, a fortuitous date), the Council of the kingdom (Cortes in Portuguese) assembled in Coimbra and declared him King John I of Portugal. After his accession to the throne, John I of Portugal proceeded to annex the cities in whose military commanders supported Princess Beatrice and her husband's claims, namely Caminha, Braga and Guimarães among others. Enraged by this "rebellion", Juan I ordered a host of 31,000 men to engage in a two-pronged invasion in May. The smaller Northern force sacked and burnt towns along the border, a common practice at the time and similar to what the English were doing in Scotland, before being defeated by local Portuguese nobles in the battle of Trancoso, in the first week of June. On the news of the invasion by the Castilians, John I of Portugal's army met with Nuno Álvares Pereira, the Constable of Portugal, in the town of Tomar. There they decided to face the Castilians before they could get close to Lisbon and lay siege to it again. English allies arrived at Easter of 1385, consisting of a company of about 100 English longbowmen, veterans from the Hundred Years' War, sent to honor the Anglo-Portuguese Treaty of 1373 (still the oldest active international treaty in the world). The Portuguese set out to intercept the invading army near the town of Leiria. Nuno Álvares Pereira took on the task of choosing the ground for the battle. Russell notes that the two Portuguese leaders [Nuno Álvares and Antão Vasques] had already shown themselves masters of the new developments in methods of warfare, i.e. the use of archers and dismounted men-at-arms. The chosen location was São Jorge near Aljubarrota, especially suitable for the chosen military tactic, being a small flattened hill surrounded by creeks, with the very small settlement of Chão da Feira (Fair's Ground) at its widest point, still present today. At around 10 o'clock in the morning of 14 August, the army of John I took its position at the north side of this hill, facing the road where the Castilians would soon appear. As in other defensive battles of the 14th century (Bannockburn (1314), Crécy (1346) or Poitiers (1356), for example), the dispositions were as following: dismounted cavalry and infantry in the centre with archers occupying the flanks. 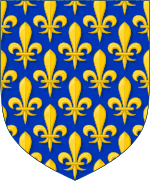 Notably, on the vanguard's left wing (later covering the left flank), a company composed by some two hundred unmarried young nobles is remembered to history as the "Ala dos Namorados" (Lovers' Flank); the right wing, also two hundred strong, known as "Ala de Madressilva" or Honeysuckle Flank, didn't achieve the same heroic fame. On either side, the army was protected by natural obstacles (in this case, creeks and steep slopes). In the rear, reinforcements were at hand, commanded by John I of Portugal himself. In this topographically high position, the Portuguese could observe the enemy's arrival and were protected by a steep slope in their front. The rear of the Portuguese position, which was in fact its front in the final battle, was at the top of a narrow slope, which came up to a small village, and was further defended by a complex series of interlocking trenches and caltrops designed to surprise and trap the enemy cavalry. This trenching tactic was developed around this time and used extensively by both the English in France and the Portuguese in the rare set-piece battles of the Crisis of the Succession. The Castilian vanguard arrived from the north around midday. Seeing the strongly defensive position occupied by the Portuguese, John of Castile decided to avoid combat on John of Portugal's terms. Slowly, due to the numbers of his army (about 31,000 men), the Castilian army started to contour the hill where the Portuguese were located. John of Castile's scouts had noticed that the South side of the hill had a gentler slope and it was there that the Castilian king wanted to attack. In response to this movement, the Portuguese army inverted its dispositions and headed to the South slope of the hill. Since they were fewer than the enemy and had less ground to cover, they attained their final position very early in the afternoon. To calm the soldiers' nervousness and to improve his army's defensive position, general Nuno Álvares Pereira ordered the construction of a system of ditches, pitches and caltrops. This application of typical English tactical procedures had also been used by the Portuguese on the previous battle of Atoleiros and was especially effective against cavalry (the speciality of both the Castilian and the French armies). Around six o'clock in the afternoon the Castilian army was ready for battle. According to John of Castile, in his report of the battle, his soldiers were by then very tired from the march that had started early in the morning under a blazing August sun. There was no time to halt then, and the battle would soon begin. Panel of glazed tiles by Jorge Colaço (1922), representing the Ala dos Namorados during the battle of Aljubarrota. On the fallen knight's shield can be read "for my lady". Lisboa, Pavilhão Carlos Lopes. The initiative of starting the battle was with the Castilian side. The French allied heavy cavalry charged in full strength, in order to disrupt order in the enemy lines. Even before they could get into contact with the Portuguese infantry, however, they were already disorganized. Just as at Crécy, the defending archers and crossbowmen, along with the ditches and pits, did most of the work. The losses of the cavalry were heavy and the effect of its attack completely null. Support from the Castilian rear was late to come and the knights that did not perish in the combat were made prisoners and sent to the Portuguese rear. At this point the main Castilian force entered the battle. Their line was enormous, due to the great number of soldiers. In order to get to the Portuguese line, the Castilians became disorganized, squeezing into the space between the two creeks that protected the flanks. At this time, the Portuguese reorganized. The vanguard of Nuno Álvares Pereira divided into two sectors. John of Portugal ordered the archers and crossbowmen to retire, while his rear troops advanced through the space opened between the vanguards. With all his troops needed at the front, there were no men available to guard the knight prisoners; John of Portugal ordered them to be killed on the spot and proceeded to deal with the approaching Castilians. Advancing uphill with the sun on their backs, squashed between the funnelling Portuguese defensive works and their own advancing rear, and under a heavy rain of English longbowmen's arrows shot from behind the Portuguese line and crossbow quarrels from behind both the Sweethearts' and the Honeysuckle wings on their flanks, the Castilians fought to win the day. The Castilian knights on the main body were forced to dismount and break in half their four-metre-long lances in order to join the constricted melèe alongside their infantry. At this stage of the battle, both sides sustained heavy losses, especially on the "Ala dos Namorados" where the Portuguese students became renowned for holding off the heavily armoured knights of the Castilian wings who, still on horseback, attempted to flank the Portuguese lines. A similar attack was more successful on the right "Honeysuckle" flank, though only briefly and late in the fight. By sunset, only one hour after the battle began, the Castilian position was indefensible. When the Castilian royal standard-bearer fell, the already demoralized troops on the rear thought their King was dead and started to flee in panic; in a matter of moments this became a general rout where Juan of Castile had to run at full speed to save his life, leaving behind not only common soldiers but also many still dismounted noblemen. The Portuguese pursued them down the hill and, with the battle won, killed many more while there was still light enough to see the enemy. During the night and throughout the next day, as many as 5000 more Castilians were killed by the neighbouring inhabitants; according to Portuguese tradition surrounding the battle, there was a woman called Brites de Almeida, the Padeira of Aljubarrota (the baker-woman of Aljubarrota), said to be very tall and strong, and to possess six fingers on each hand, who by herself killed eight Castilian soldiers as they were hiding in her bakery in the town of Aljubarrota after the battle. This story is clouded in legend and hearsay, but the popular intervention in the massacre of Castilian troops after the battle is, nevertheless, historical and typical of battles in this period, when there was no mercy toward the defeated enemy. On the morning of the following day, the true dimension of the battle was revealed: in the field, the bodies of Castilians were enough to dam the creeks surrounding the small hill. In face of this, the Portuguese King offered the enemy survivors an amnesty and free transit home; an official period of mourning was decreed in Castile that would last until the Christmas of 1387. The French cavalry had suffered yet another defeat (after Crécy and Poitiers) to English defensive tactics, even though they were to eventually defeat the English and unify their country in the final stages of the Hundred Years' War. In October 1385, Nuno Álvares Pereira led a pre-emptive attack against Mérida, in Castilian territory, defeating an even larger Castilian army than at Aljubarrota in the battle of Valverde, in Valverde de Mérida. Scattered border skirmishes with Castilian troops would persist for five years more until the death of John I of Castile in 1390, but posed no real threat to the Portuguese crown; recognition from Castile would arrive only in 1411 with the signing of the Treaty of Ayllón (Segovia). This victory of Aljubarrota confirmed John of Aviz as the uncontested King of Portugal and the House of Aviz ascended to the crown of Portugal. In 1386, the closeness of relations between Portugal and England resulted in a permanent military alliance with the Treaty of Windsor, the oldest still active in existence. John's marriage to Philippa of Lancaster in 1387 initiated the Portuguese second dynasty, and their children went on to make historically significant contributions. Duarte, or Edward of Portugal, became the eleventh King of Portugal known as "The Philosopher" and "The Eloquent", and his brother Prince Henrique, or Henry the Navigator, sponsored expeditions to Africa. In commemoration of the Battle of Aljubarrota the Portuguese erected the Monastery of Saint Mary of the Victory (Portuguese: "Mosteiro de Santa Maria da Vitória"), one of the best original examples of Late Gothic architecture in Portugal, intermingled with the Manueline style. In 1393 a chapel in honor of St. Mary and St. George was erected in the place where the standard of D. Nuno Alvares Pereira had been during the confrontation, allowing us to know the precise geographic location of the battle site. In 1958, archeologist Afonso do Paço organized the first campaign of excavations, revealing the complex defensive system consisting of about 800 pits and dozens of defensive ditches and revealing one of the best preserved battlefields of the period of the Hundred Years' War. In March 2002, under the initiative of António Champalimaud, the Battle of Aljubarrota Foundation was created. The Foundation began its activity by recovering the battlefield of Aljubarrota. Through a Protocol established with the Ministry of Defense in August 2003, the Foundation received authorization to transform the Military Museum into a modern Interpretation Center of the Battle of Aljubarrota. This Interpretation Center was inaugurated on October 11, 2008. On December 28, 2010, the Portuguese Official Journal published the Decret-Law n.º 18/2010, which states the legal recognition of the battlefield of Aljubarrota with the category of "National Monument". Duarte, Luís Miguel (2007). Aljubarrota 1383 / 1389 (in Portuguese). Quidnovi. ISBN 9789728998875. Monteiro, João Gouveia (2003). Aljubarrota — A Batalha Real (in Portuguese). Tribuna. ISBN 9789728799724. Russell, Sir Peter (1955). The English Intervention in Spain & Portugal in the time of Edward III and Richard II. UK: Oxford Clarendon Press. p. 397. ("Chronicle of king Fernando I") Crónica de el-rei D. Fernando, first published 1816 in J.F. Correia da Serra, editor, Collecção de livros ineditos de historia portugueza, Vol.IV Lisbon: Academia das Ciências de Lisboa. ("Chronicle of king John I, Part I & Part II" ) Chronica del Rey D. Ioam I de Boa Memoria, e dos Reys de Portugal o Decimo, Primeira Parte, em Que se contem A Defensam do Reyno até ser eleito Rey & Segunda Parte, em que se continuam as guerras com Castella, desde o Principio de seu reinado ate as pazes , first published 1644, Lisbon: A. Alvarez. ^ At this time (14th century), Castile is not synonymous with "Spain". A global Iberian political entity, had first appeared as a Visigothic Kingdom in the very end of the era of the Roman Empire was dismantled after the Muslim invasion of 711. After that, the word "Spain" was used to designate the Iberian peninsula from a geographical and cultural and even political point of view. The proper term which more enlightened scholars use is Iberia, the geographical vast peninsula, encompassing Portugal, an autonomous kingdom since 1139, and several other kingdoms. These other kingdoms eventually agglutinated under one central power, Castile, and named Spain, after Hispania which was hitherto used in the plural (Hispaniae or the Spains) to refer to all of the nations on the Iberia peninsula. The country 'appeared' in the second half of the 15th century, with the marriage of the Catholic Monarchs – Isabel of Castile and Ferdinand of Aragon – the rulers, together, of the Crown of Castile, (the union of the kingdoms of Castile, León, Galicia, Asturias, the Canary Islands and the later conquered kingdom of Granada) and the Crown of Aragon (Aragon, Catalonia, Valencia, the Balearic Islands, Sicily and other territories in the Italian Peninsula). "Battle of Aljubarrota Foundation - Official Website". Retrieved 21 March 2014. Wikimedia Commons has media related to Battle of Aljubarrota.